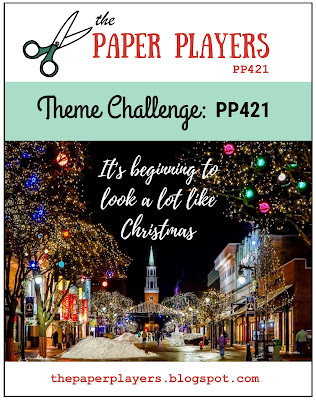 It's my pleasure to host our Paper Players challenge this week - and it's theme week. I thought the theme was perfect for those of you who are (like me) procrastinators... and still have Christmas cards to make? Please don't tell me that I am the only person who still needs to finish their Christmas cards! Here's the challenge - with another awesome badge from Nance. Isn't that just gorgeous? Nance really does an amazing job of finding photo inspirations for our badges and this one reminds me of a Hallmark Christmas movie! I stamped my snowman in grey and then colored his scarf and the berries from the holly. I stamped the sentiment - really meant (I think) for the inside, onto the front. It is such a gorgeous sentiment and I thought it deserved to have center stage. Somehow, it just felt right with this image. I know this is a pretty unconventional color scheme for Christmas, but it's the second Christmas card I have made with these colors.... so, it must have struck a chord with me somewhere! YAY! I managed to go into my craft room and make.... let me count them..... two... yes, two cards. I know it doesn't sound like much, but it's more than I have made in the last 4 weeks! Consequently, I will have some cards to share with you this week. I also finished decorating the house. It was already feeling nice and cozy, but needed just a couple of finishing touches. This year, we ended up with a red and gold theme. Now, I have to tell you, I am NOT a gold person. I don't even wear gold jewellery... but there was something about a cushion that I saw at Pier 1 that just sold me on this color scheme. Also, it fits really well with the gorgeous angels that we have had since we moved into our "new" house in 2012. I will be sharing some photos with the Christmas cards later this week. In the meantime, warm hugs and prayers for those of you who need a little lift tonight.